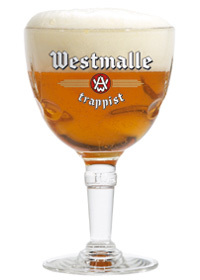 “Westmalle Tripel is a clear, golden yellow Trappist beer that undergoes a secondary fermentation in the bottle (9.5% alcohol). It is a complex beer with a fruity aroma and a nice nuanced hop scent. It is soft and creamy in the mouth, with a bitter touch carried by the fruity aroma. An exceptional beer, with a great deal of finesse and elegance. And with a splendid long aftertaste. Appearance: Golden yellow and a little cloudy with a lot of foam and lacing. Taste: A little citrusy but then full of spices (nutmeg, allspice, clover cinnamon). Overall, very smooth with a nice finish. This was a very good beer. Crisp, refreshing, flavorful. This was just a real drinkable beer, so much so that the 9.5% ABV could be problematic if you tried to make this a session beer. I had this beer at St. Andrews Bar during Anniversary Weekend in NYC. You are 100% correct! This is an incredibly drinkable and highly potent brew. Those Monks know what they’re doing!